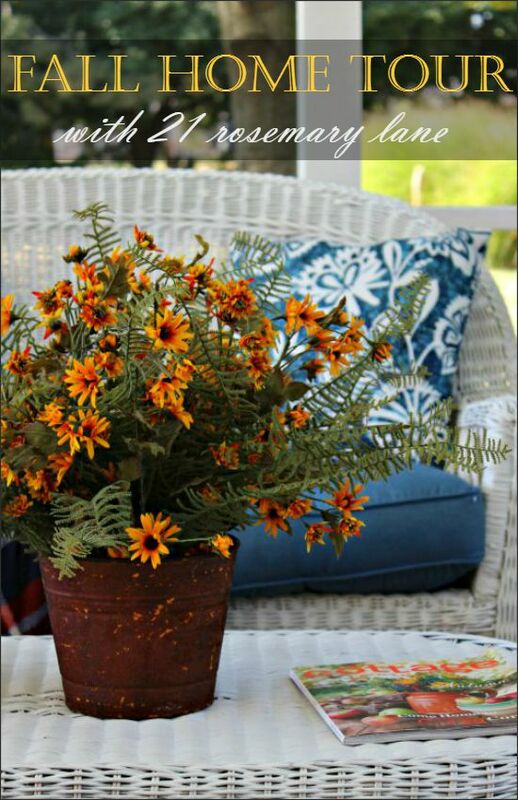 Hi everyone and welcome to the first day of the 2015 Fall Home Tour series which will be showcasing 30 of your favorite blogger homes all decked out for this glorious season. I am so thrilled to be part of this parade of homes since the fall is my absolute favorite time of the year! If you are visiting 21 Rosemary Lane for the first time I hope you will become a regular reader, it would be great to have you along for the ride. And if you are arriving here from Jeanette's blog Snazzy Little Things welcome and enjoy the next leg of this bloggy tour! This year I kept our front porch very simple. 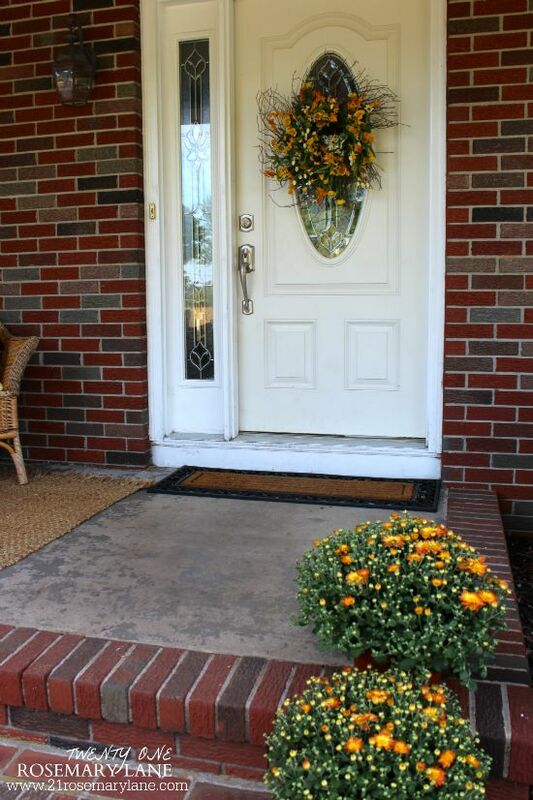 Just some mums and seasonal wreath to accent the front door. These 2 wicker chairs are slated to be the end chairs of my new table (we are currently creating) for the back screened in porch area. 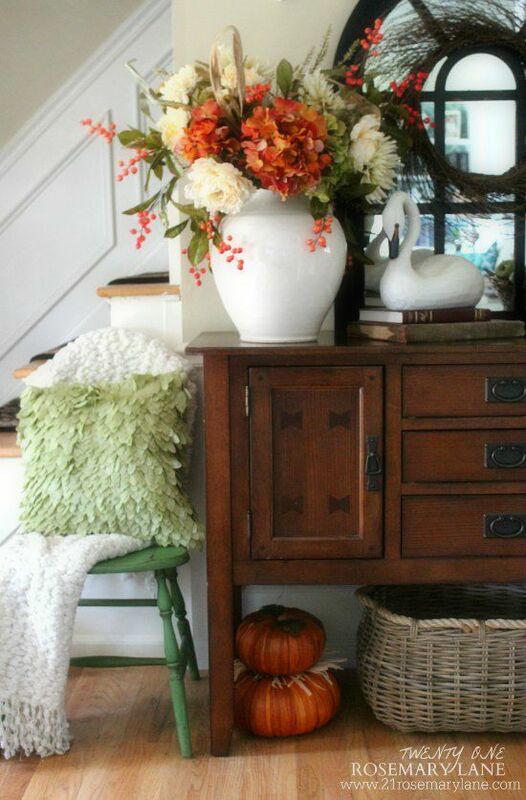 Our fall entry features a Home Goods pitcher filled with autumn inspired florals. 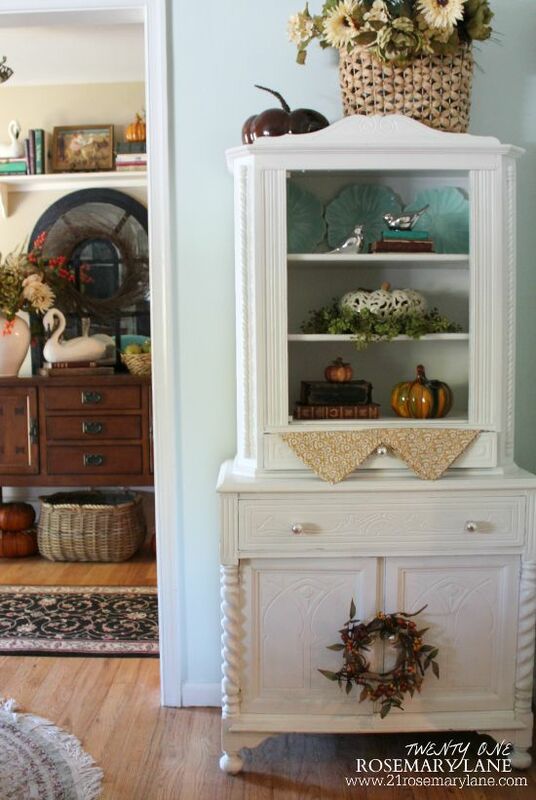 I so adore this small hutch my dear friend Colene gave me last year. I really love to decorate it for each of the seasons. 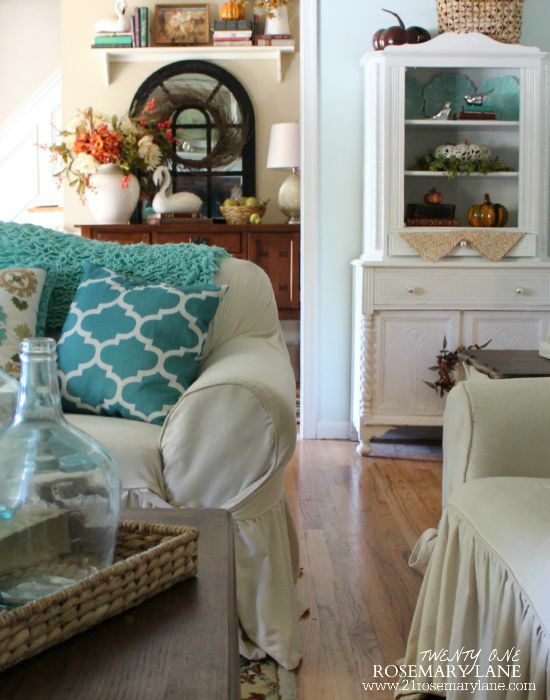 The living room is sprinkled with pretty oranges and natural hues. A great contrast to all of the turquoise in this space. 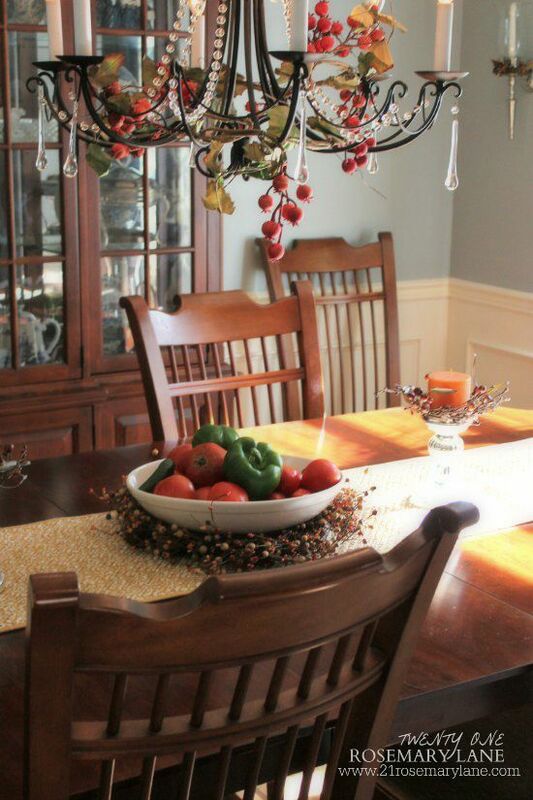 Our dining room has more of a colonial vibe, so I typically like to decorate it using natural seasonal elements like gourds and squashes. However it is a little too early for pumpkins in these parts so instead I used what I happen to have on hand...fresh tomatoes and peppers right out of our garden. Tossed together in a pretty white pasta bowl, our garden goodies make a lovely seasonal centerpiece display. The buffet's mirror is adorned with another colorful autumn wreath. And now on to our newest redecorated space...the screened in porch! Since we moved here some 13 years ago the porch has been in desperate need of new screens, so this summer we were finally able to tackle this rather large project. In addition to replacing the screens we also painted the entire wood frame both inside and out, and Mr. Rosemary Lane added the wood "X's" to the lower portion of the screens. This was to not only reinforce the screens but to also to deter our family's 100 lb. furbaby from creating his own entrances and exits on and off the porch. Almost every piece of white wicker was either found or given to me with the exception of the chair and rocker which were both thrift shop and yard sale finds. I am so in love with all of the fresh blue and white in this space. The color combination is very nautical yet it is easy to add accent colors to create a seasonal feel. There is our furbaby now! No busting through our new screens in Mr. Buster! Our other furbaby Moe decided to grab a catnap on one of the settees! I sure hope you enjoyed this fall tour of our home. The next blog up on this tour is the beautiful blog Peaceful Home Decor. Hop on over and see all of the fall beauty at Kelly's blog. You will most certainly be inspired! 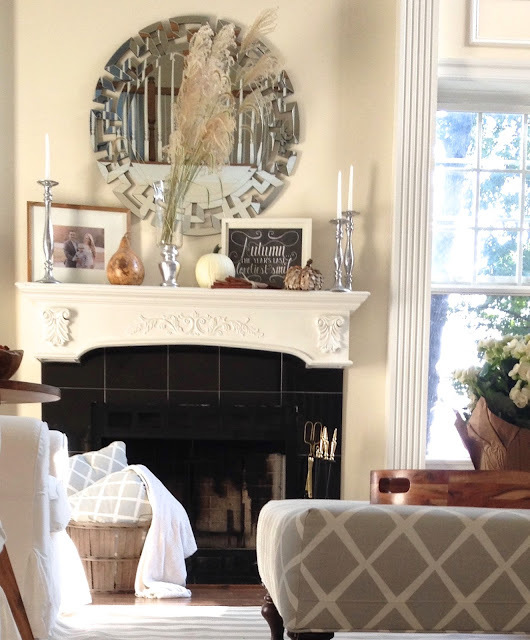 Thank you to my special friend Marty from the gorgeous and so stylish blog A Stroll Thru Life, for putting together this amazing fall home tour series. If you haven't already, you must check out this amazing and creative lady's home tour...it is a MUST SEE! Don't miss any of the tours going on today and for the rest of the week! Here is the complete schedule. 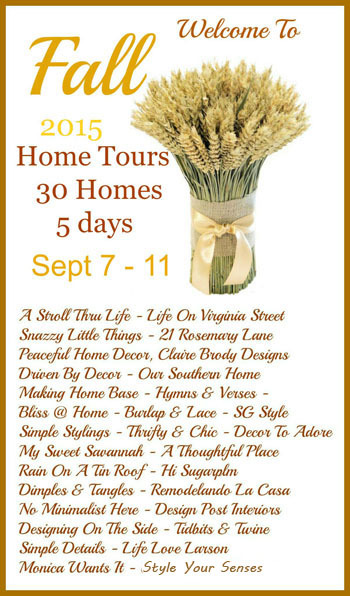 Remember 6 blog tours each day for five fantastic days! Wishing you all a very Happy Labor Day and wonderful week of autumn inspiration!!! Oh Barbara, everything is so beautiful. 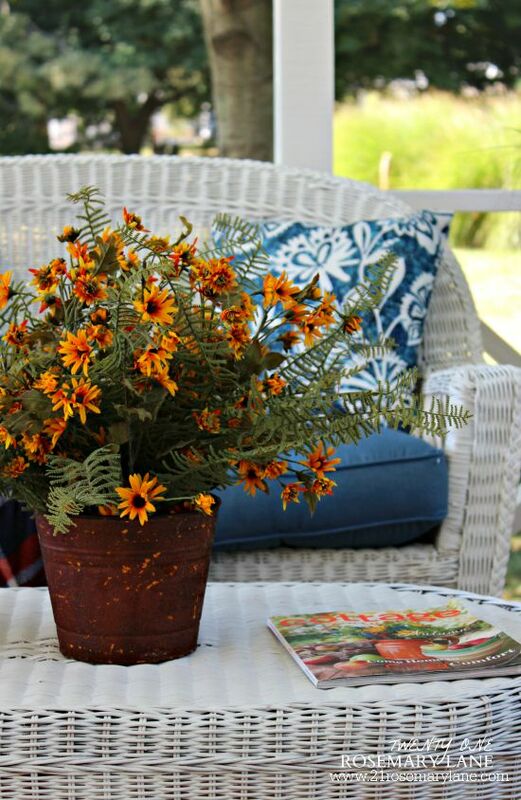 I love your floral arrangements you have created and the additio of orange with your beautiful turquoise is stunning. 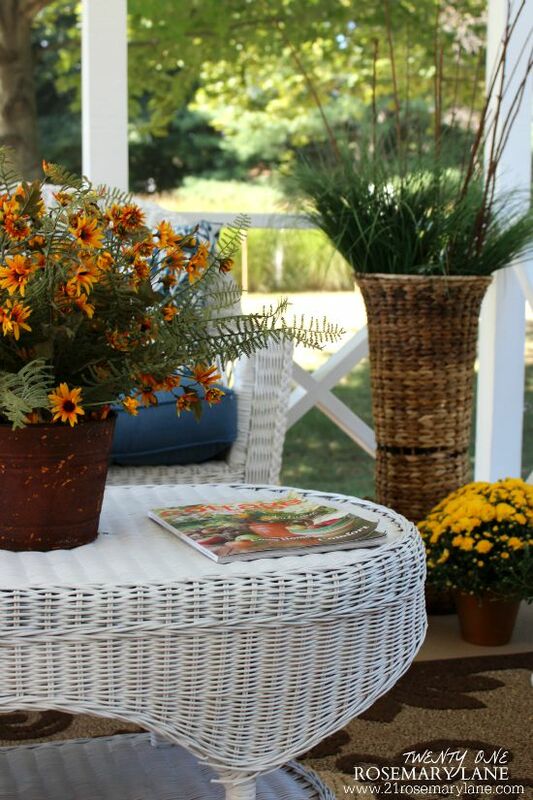 I love that porch too, what a great place to sit and enjoy fall. Each and every vignette is completely lovely! The entryway in particular is cozy and charming. Your home looks outstanding...thanks for the tour. 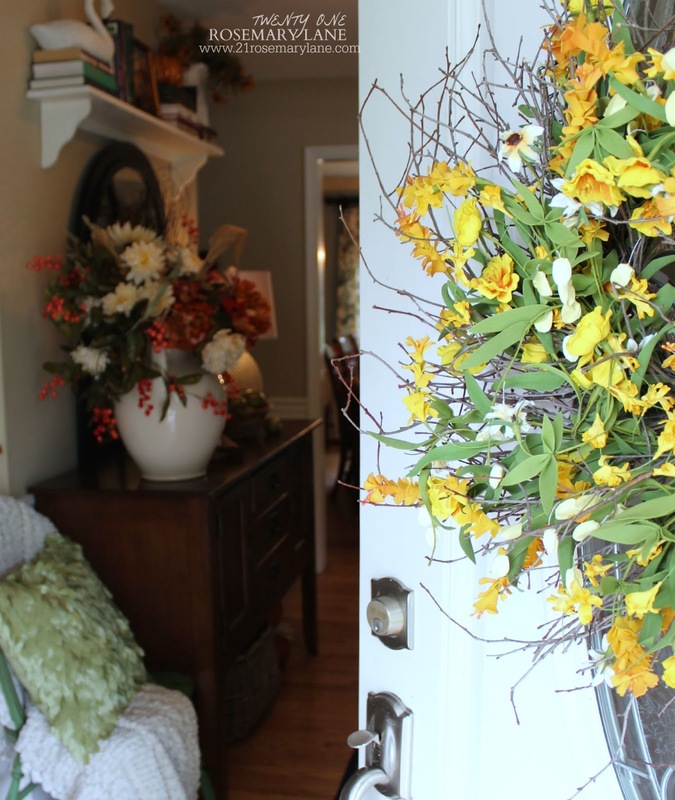 I am quite smitten with the floral arrangement in your foyer, dear friend!!! 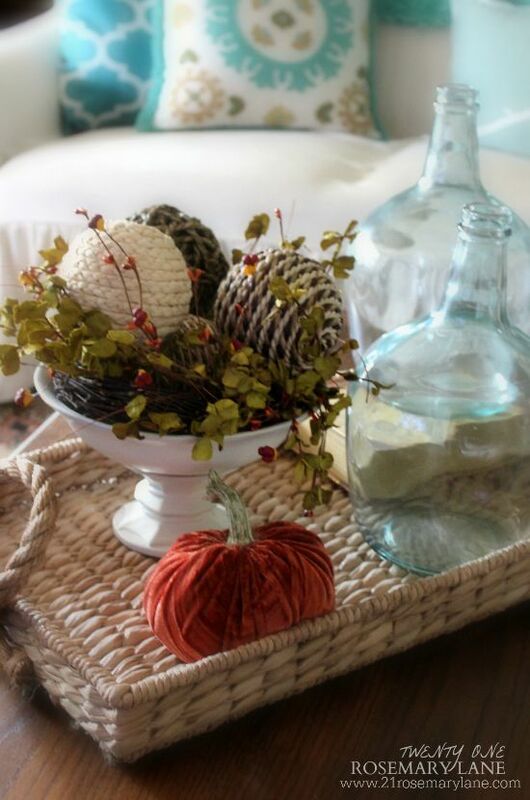 You home is lovely with the early Autumnal touches!!! I l o v e those wicker chairs on your front porch!!! 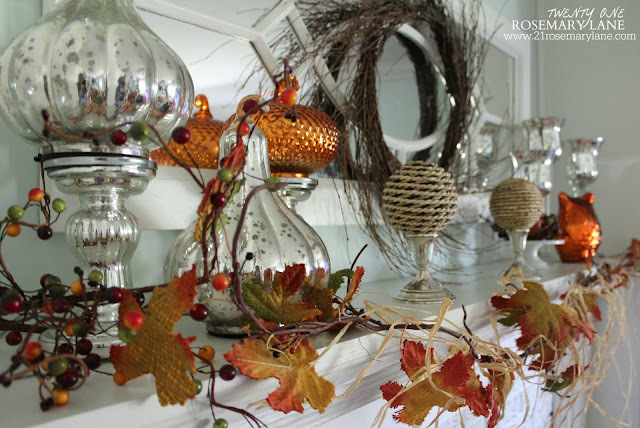 Thanks for sharing your house all decorated for fall - you have such a beautiful home! I'm especially swooning over your porch - wow! It is all soooo pretty, but my favorite is how you used produce from your garden as a centerpiece! Beautiful Barbara! 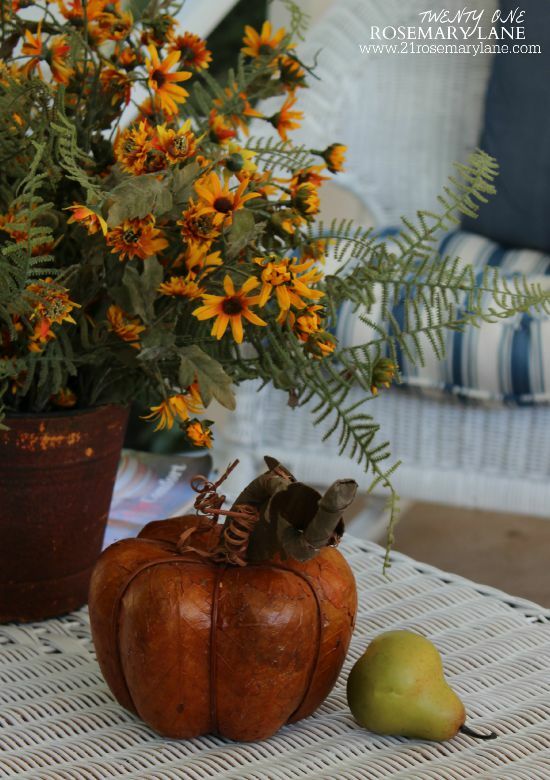 You have decorated so pretty for Fall and I LOVE your screen porch. 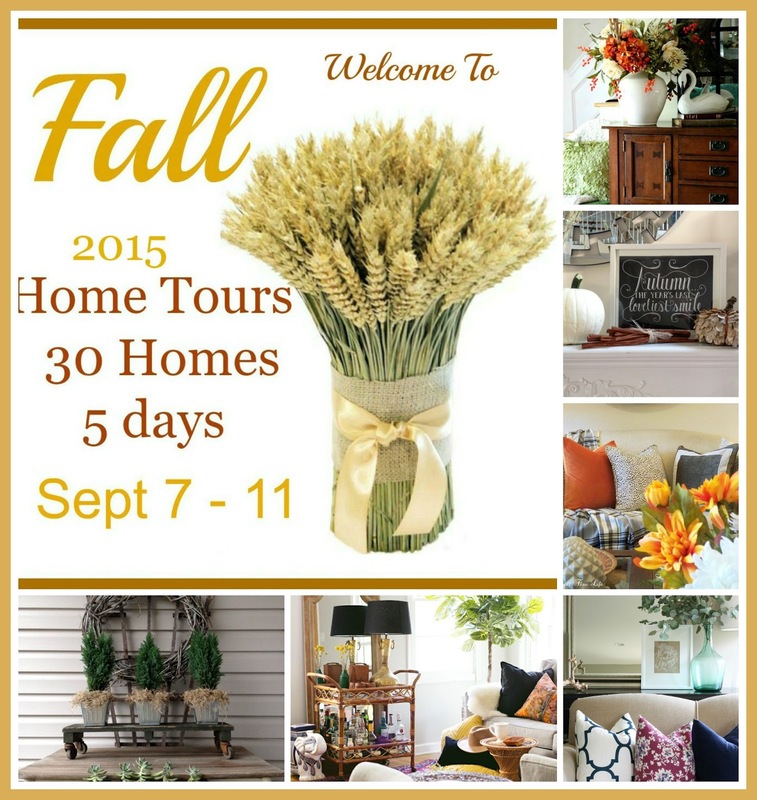 Such a beautiful tour with lovely fall decor! Your home is beautiful, Barbara!! 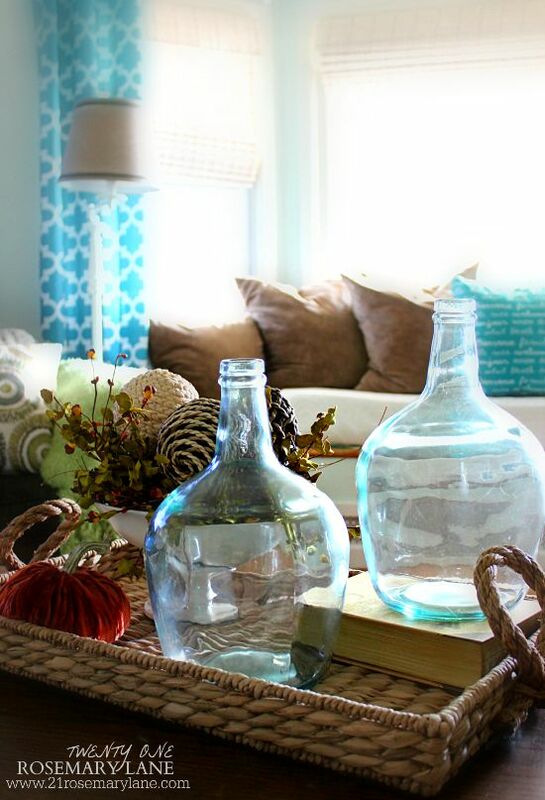 I love your unexpected combination of aqua and orange paired with all the fall decor. 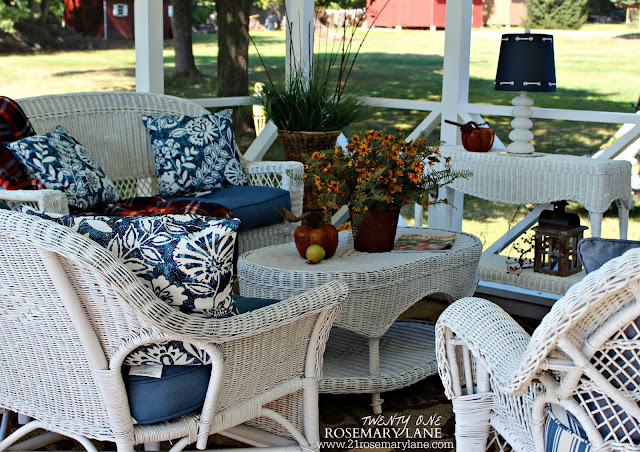 And, oh my, your screened porch is so charming!! Thanks for the wonderful tour! Barbara your home is gorgeous. Everything looks so pretty for fall. Have a great new week. Beautiful Barbara!! Now that kids are going back to school I'll start my Fall decorating. I enjoyed your pretty Fall tour. 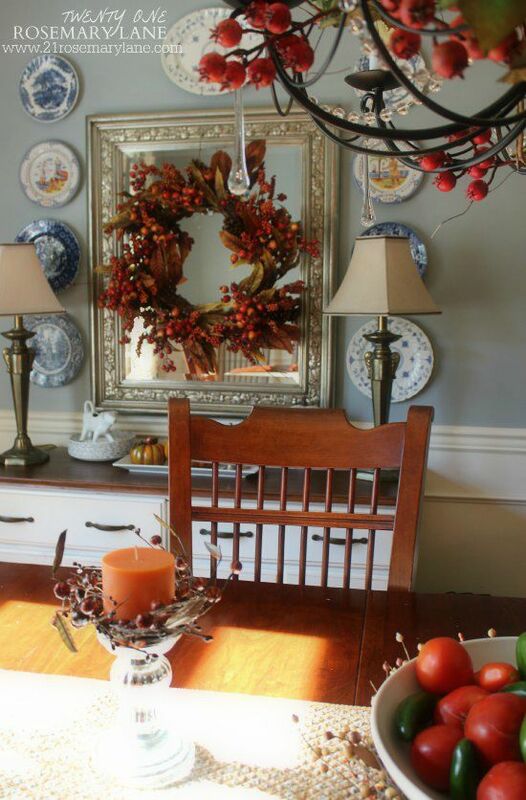 I just love how the orange of the wreath goes with the blue plates above the buffet! 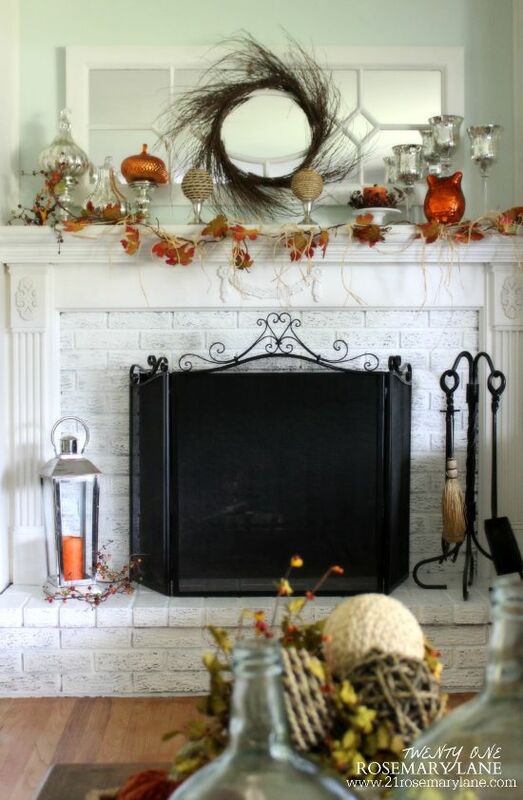 Beautiful Fall in your beautiful home! 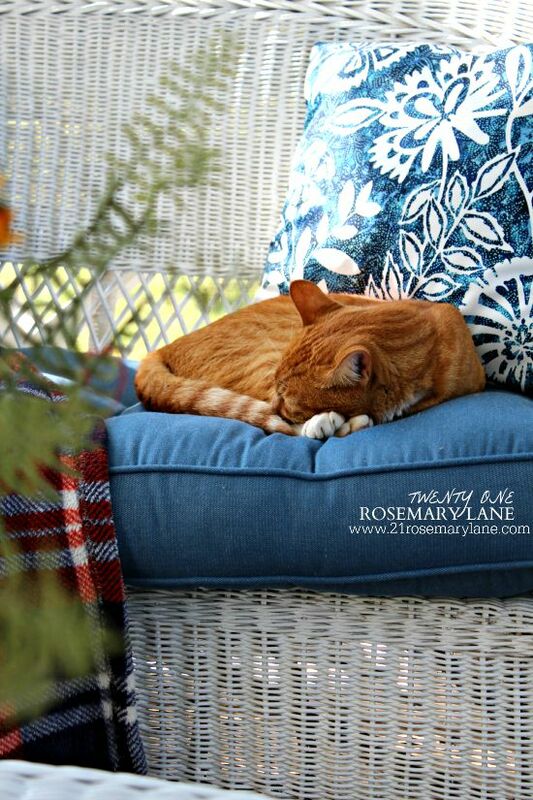 I so enjoyed the snippets of orange and blue and oh your outdoor space is stunning as well. Thank you for inviting us! Your home looks so lovely with all the touches of fall you've added. 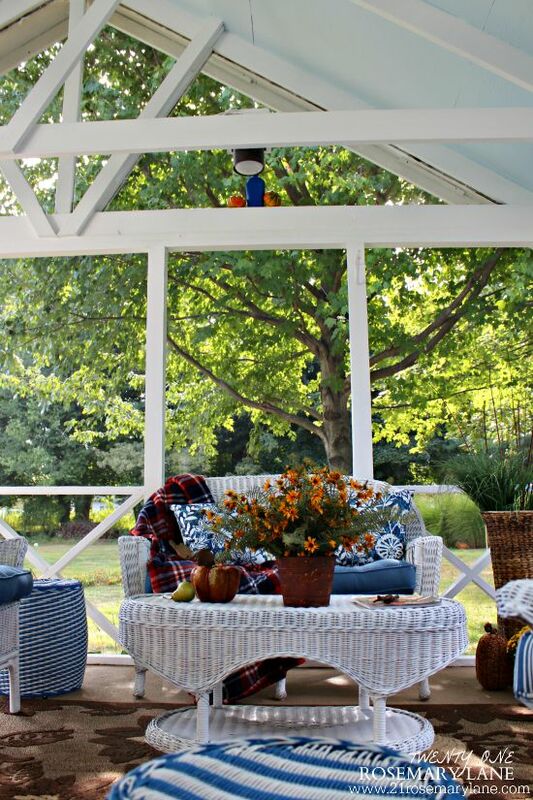 The sun porch is such a gorgeous space, I love how the blues mixed up with the oranges so well! Hi Barb, your home all decked for Fall is really gorgeous. 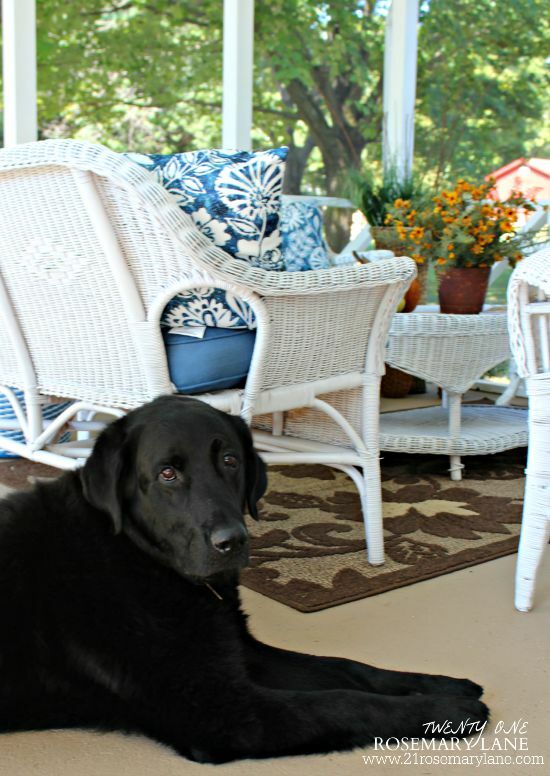 LOVE seeing your fur-kids enjoying your wonderful porch! ps Barb, I just sent you an email. Your home is gorgeous! And your porch is to die for. I love all the Fall touches you've added! 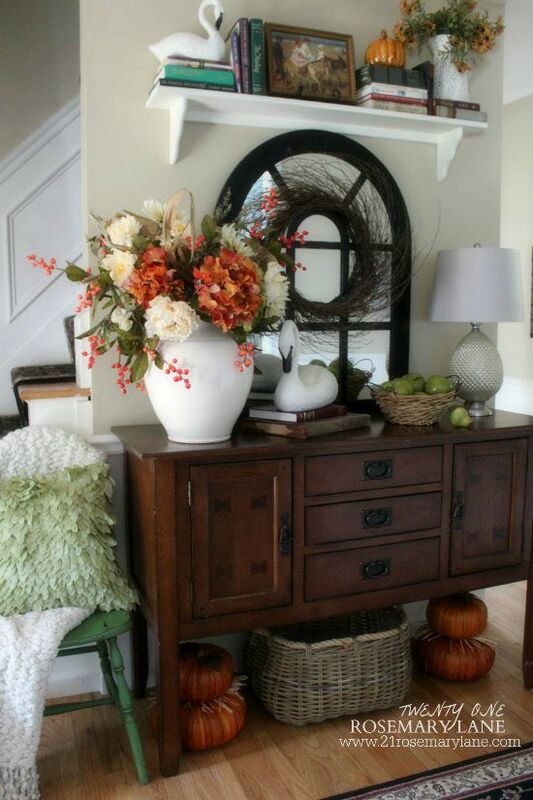 Love the big large vase with the fall florals! Beautiful and so warm and welcoming. I love your furbabies as well! Beautiful tour! 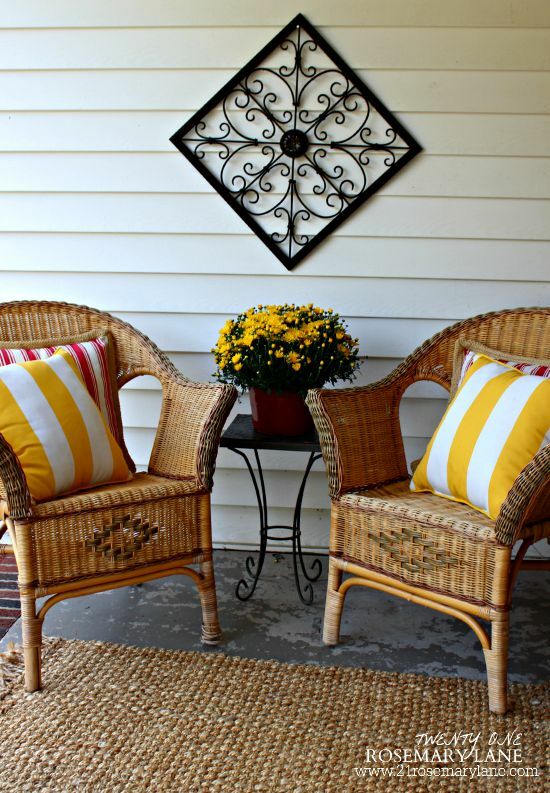 I love the pop of yellow on the striped pillows! hello, you have a beautiful home. could you tell me where did you purchase the pillow that has a round medallion in the center of it. Your home is so beautiful! 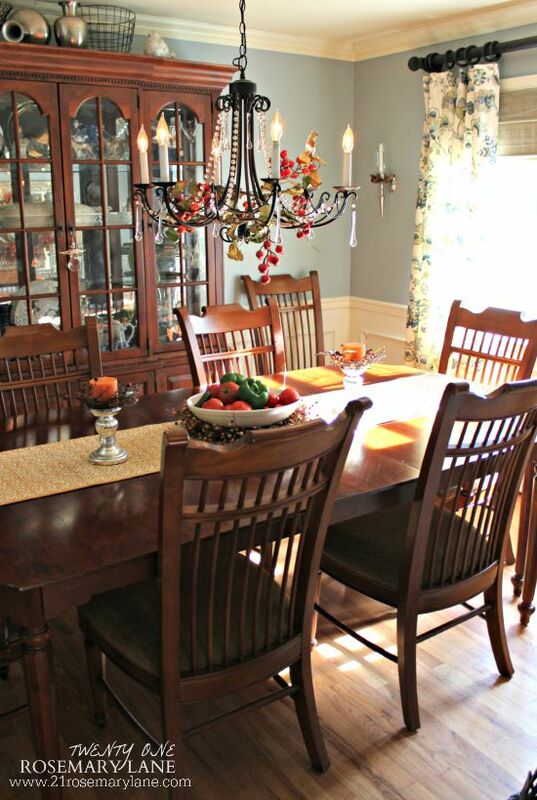 Light and airy.... inviting to curl up in a chair and settle in for an afternoon of sweet fellowship! Beautiful and warm home! 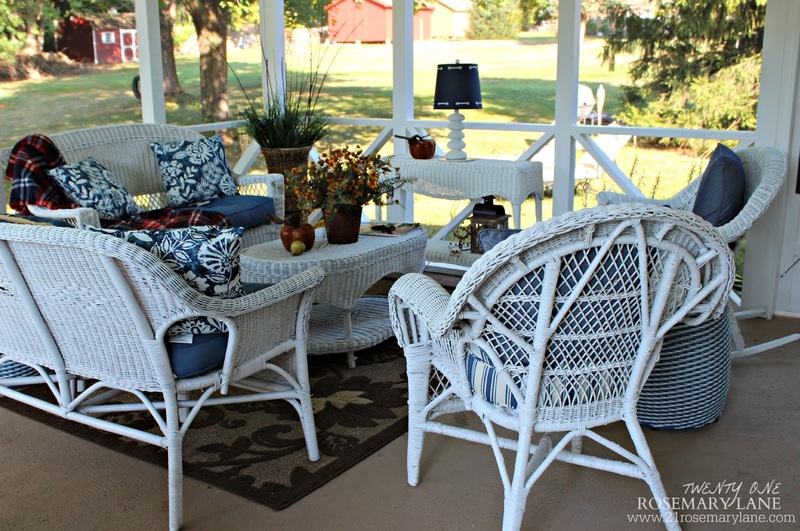 Love, love your screened in porch area! Happy to be on the tour with you! Gorgeous fall home, Barbara! Everything looks cozy and inviting!